Pete and Ivy have a great new DVD out. Click here to learn more. Pete shows a bunch of cool stuff and EasyCare's new Easyboot Glue-On. 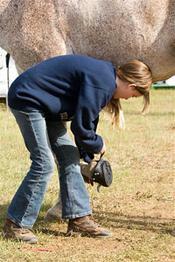 This video is designed to teach equine professionals and horse owners how to select and maintain hoof trimming tools. It will teach you to put a razor-edge on hoof knives, loop knives and nippers using files, diamond stones and Dremel Tools. Using demonstration on cadavers and live horses, Pete shows you how to succeed with glue-on boots, hoof epoxies, hoof casts, pour-in pads, impression material and cast/pad combos. Check out these two videos below. It's pretty easy to see the differences in concussion. 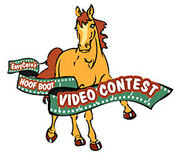 EasyCare has a great video library filled with educational videos that can help you with your hoof boot fitting and repair needs. These instructional videos sure do come in handy, so be sure to check them out! Have you thought about entering EasyCare's Summer Video Contest but not gotten around to entering? Well, your time is running short. The contest ends at midnight Friday August 31st. Just one day left to get your entry in!!! So join in the fun and submit your video if you haven't already. Need some extra inspiration? Check out our latest contest entry below. Visit our Video Blog to see the entries we've already received. We have added a couple new videos to the EasyCare website. 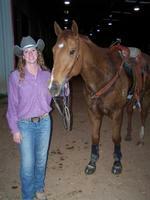 My personal favorites is the new video of Clinton Anderson working his horse in Easyboot Epics.